I bought a big stack of corn tortillas and was wondering what might be a good way to use them for breakfast. 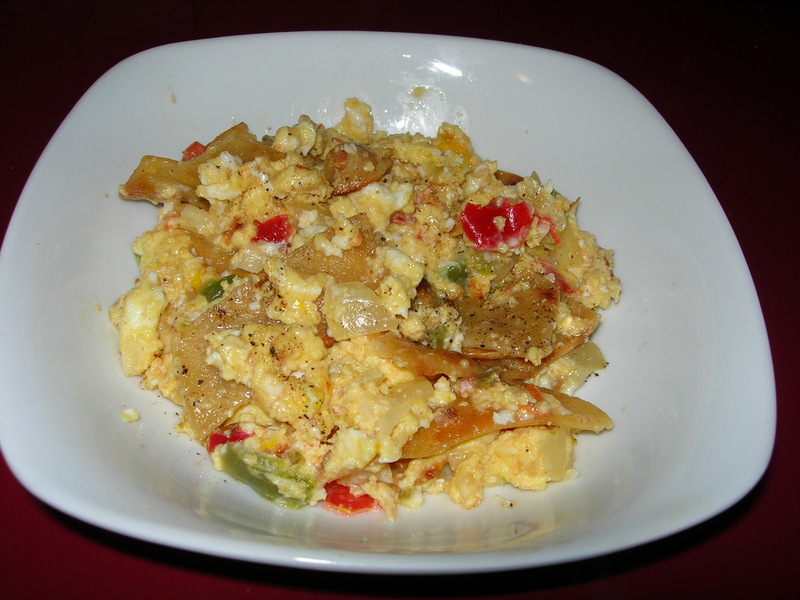 I decided to make migas – a popular dish across the Spanish-speaking world, though not always made with tortillas. In Spain they will uses bread and potatoes and lima beans while in Mexico, you are more likely to get migas with tortilla strips and a lot more heat. I have seen them made with the tortillas cooked with the eggs and with the tortillas cooked in advance and added to the eggs at the end. I decided to make it both ways, cooking them with the eggs yesterday and separately today. While they both tasted good, the second was by far the best – so that’s what I will show here. So first I took 2 corn tortillas and sliced them into 1 inch strips and then cut those long strips in half. In a skillet, I melted 1 TBSP of butter and pan-fried the strips until browned and crisped. I removed them from the butter and set them aside. I added 2 tbsp of chopped onion and one minced small clove of garlic and let them sauté in the butter. I chopped up 2 TBSP of bell peppers (red, yellow and green) and 1 thick slice of tomato (about 2 TBSP) and added them to the softening onions. I let them cook. Meanwhile I cracked two eggs in a bowl and stirred them for scrambled eggs. When scrambling eggs, I mix them just enough to mix the whites and yolks but do not beat them. I prefer creamy eggs and over-mixing them will make them dryer. Note I also add no salt while cooking. Salt will make the egg mixture separate and the eggs will not be as creamy and tender. I added the eggs and let them cook, stirring frequently. When the eggs are just about done, toss in a small handful of grated cheese. Adding the cheese to early will make the eggs runny. I used Pepper Jack for a tiny bit of heat. Just before serving, I added salt and pepper and stirred in the tortillas I set aside. Cooked this way, the tortillas are crispier and are more evenly browned. There’s not the slightest hint of sogginess. The eggs are rich and creamy and the flavors blend beautifully. Makes 1 serving.